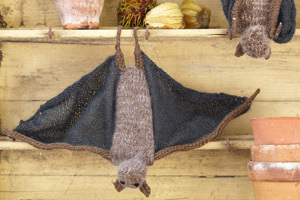 The fruit bat, or megabat, is also known as the flying fox. They are sociable animals, roosting together in the tops of trees, grooming, squabbling and in the summer urinating and then fanning themselves with their wings to cool down. Aesop told a fable about a bat that borrowed money to start a business. The business failed and the bat had to hide during the day to avoid the people it owed money to. According to Aesop, that is why bats only come out at night.